ANKARA (Reuters) - Turkish president-elect Tayyip Erdogan looks set to maintain his influence on daily politics after being sworn in next week, with close allies likely to take on cabinet posts in a new government and his economic team expected to remain largely intact. Outgoing president Abdullah Gul said on Tuesday that Foreign Minister Ahmet Davutoglu was likely to take over as chairman of the party and become the next prime minister, rekindling speculation about the shape of the new cabinet. Davutoglu, an academic who has served as Erdogan's foreign minister for the past five years, is expected to be confirmed as the ruling AK Party's nominee for chairman on Thursday before being formally voted in at an AK general assembly on August 27. Senior AK officials told Reuters that ministers responsible for the economy would remain in place under Davutoglu, and that close Erdogan allies including his top aide Yalcin Akdogan and intelligence chief Hakan Fidan might be given cabinet positions. Investors have been particularly concerned about the fate of Deputy Prime Minister Ali Babacan and Finance Minister Mehmet Simsek, who have guided the economy towards unprecedented stability in recent years. "The decision will be up to Erdogan and Davutoglu, but in the new cabinet which is expected to be formed at the beginning of September, no changes are expected with Babacan and Simsek or other economic portfolios," one senior AK official said. Erdogan, who co-founded the AK Party and has dominated Turkish politics for more than a decade as prime minister, won the country's first national presidential election on Aug. 10 with 52 percent of the vote. Previous presidents were elected by parliament. Senior officials had told Reuters before the vote that economic ministers would be retained at least until a parliamentary election next June if Erdogan won. Erdogan will step down as leader of the AK Party when he is inaugurated on Aug. 28, as required by the constitution, but has made clear that he wants the party he co-founded with Gul more than 10 years ago to remain loyal and unified. "Davutoglu is certainly someone that Erdogan can control, because he doesn't have his own constituency. Erdogan made him. He's about the most amenable prime minister that could be chosen," one European diplomat said. But investors are likely to see Davutoglu, a well-known figure internationally and respected within the AK Party, as a choice representing stability given his foreign policy experience, particularly if he retains the economic team. "Davutoglu is the highest-profile person within the AKP with whom Erdogan could work comfortably as prime minister, under a de facto presidential system," said Ozgur Unluhisarcikli, director at the German Marshall Fund think-tank in Ankara. "He's becoming prime minister at a very difficult period, facing severe foreign policy choices but also serious economic choices and domestic tensions." Erdogan wants a strong and loyal party leader to boost the AK's majority in next June's election, a result which would help him to change the constitution and strengthen the powers of the presidency. While Davutoglu is likely to back him in this, he would lack his predecessor's high profile among the AK's core voters, meaning Erdogan may try to continue to assert his influence over the party even after breaking formal ties. "Davutoglu lacks Erdogan's caustic rhetorical skills and ability to inspire almost fanatical personal devotion amongst the AKP's grassroots. 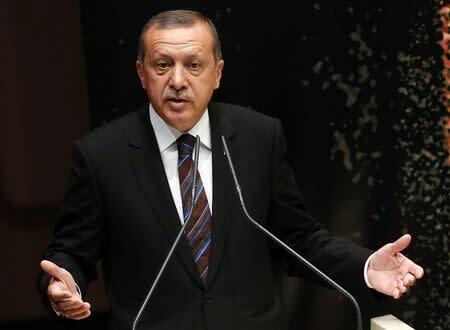 He is likely to struggle to impose himself and be dependent on Erdogan to maintain party unity," risk research firm Teneo Intelligence's Wolfango Piccoli said. Davutoglu has overseen Turkish foreign policy at a turbulent time for the Middle East, with wars in neighboring Iraq and Syria and the Arab Spring uprisings, but his "zero problems with the neighbors" policy has crumbled, with relations degraded with Egypt, Syria, Israel, Iraq and Iran. "In the Middle East he is basically persona non grata ... they're isolated. Countries like Egypt are hardly going to be happy if he is prime minister and Erdogan is president," the European diplomat said. Gul, who commands respect among core AK voters and is seen as a more conciliatory figure than Erdogan, had long been touted as a future prime minister. But he has been sidelined in recent months and, with the AK general assembly a day before he leaves office, could not in any case immediately become party leader. Senior AK officials said intelligence chief Hakan Fidan, one of Erdogan's closest confidantes, and EU minister Mevlut Cavusoglu were being considered as possible replacements for Davutoglu in the role of foreign minister. Top aide Yalcin Akdogan was also expected to take up a position in cabinet, possibly as a deputy prime minister, while AK deputy chairman Mustafa Sentop is seen as a candidate for justice minister, the officials said.